These small carving tools show some of the same features of full-sized gouges and chisels intended for heavier work. Forged bolsters and ferruled handles will hold up to work with a light mallet as well as hand pressure. Four-and-1/4 inches overall length allows the base of the octagonal handle to fit against the palm while the shank of the tool slides between the fingers for fine control. The five tools include a 4mm V parting tool, 6mm skew chisel, and 6mm square chisel plus two gouges in 4mm and 8mm widths. The set is enough for beginners to experiment with simple relief patterns and has enough quality and durability to be useful even at the expert level. Though the 2-1/4-inch-long tempered high carbon steel blades are polished, check edges of shanks for burs before use. A few strokes with a honing stone should remove any sharp edge where steel slides against fingers. Hand sharpening is recommended since these small tools will overheat quickly if sharpened on a grinding wheel. Small blades also call for a softer temper than do larger gouges, so ordinary whetstones will do a good job of shaping and honing edges. 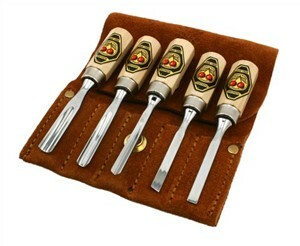 The delicate edges will be well protected in storage by the five-pocket leather tool pouch, which comes with the set.